“Over the years, we’ve had dead swans, dead dogs, Chinese take-aways and even a dead body left in our recycling textile bins, says Ross Barry, the managing director of LM Barry, a small family run business that acts as one of the middle men in the textile recycling trade. His father set up the business in 1985 but it was not until the 1990’s that textile recycling became popular. The company has approximately 1000 recycling bins located predominately in the South East of England. Most companies in the trade are small family businesses. “The large corporates find it too difficult and complicated dealing with the merchants in Africa and over the years we have built up these relationships,” Mr Barry says. 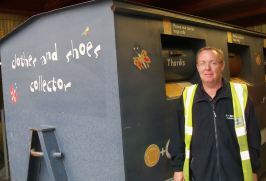 LM Barry has a roll on textile bin in the major Camden recycling centre, which collects between one and two tonnes of textile waste each week. The firm pays Camden Council based on the weight and one tonne of textile waste can be bought for between £250 and £350. The company has an army of sorters back at their base who wade through the clothing. Only 20 per cent is fit to be recycled here in the UK. Any wool and synthetic materials are shredded down to their fibres and can be used as mattress filling or as sound insulation products for the motor industry. Cotton clothing is cut up and used as textile wipes in the cleaning industry. The remaining 80 per cent of clothing is packed into 45-50kg bales and sold onto merchants abroad. These merchants then sell the clothing onto local sellers. The top five to ten per cent of quality clothing goes to Eastern Europe (vintage clothing is sold at a premium), 70 per cent goes to Africa and the lowest quality and remainder goes to Pakistan.